At the U.S. President’s Emergency Plan for AIDS Relief (PEPFAR), we measure our progress with metrics that account for every program, dollar, and service received. While these indicators help us become more efficient and effective in the work we do, their significance pales when compared with the most important metric of all — a life saved. To save any life is a remarkable feat, but to spare a child from HIV is truly extraordinary. That’s why Secretary Kerry’s June 18 announcement that a cumulative total of one million babies will have been born HIV-free this month due to direct PEPFAR support is so remarkable. One million babies born HIV-free. This achievement would have been unimaginable ten years ago when the U.S. Congress passed the legislation that created PEPFAR, yet today, we can celebrate this momentous milestone. We’ve known for over a decade that antiretroviral drugs can help to prevent vertical transmission of HIV. In fact, the earliest United States government funding for global AIDS programming supported prevention of mother-to-child transmission (PMTCT). Over the years, the science has come a long way and the antiretroviral medication (ARV) that we now use are both more effective and less toxic than those used decades ago — allowing us to initiate pregnant women on treatment earlier. The earliest PMTCT regimen — a single dose of the antiretroviral drug, Nevirapine — decreased the likelihood that a mother would transmit the virus to her baby from 35 percent (with no PMTCT intervention) to 24 percent. Fortunately, today, we have far more successful interventions. The same combination of efficacious ARV medications used to treat adults living with HIV can be used for PMTCT to reduce the likelihood that a mother will transmit the virus to her infant to less than five percent. We now know that getting women onto lifelong ART as early as possible both significantly reduces the likelihood HIV will be passed on to her child, and protects the mother’s own health. We have gained real momentum now — driven by political commitment and leadership, and enhanced by science — now we must continue to join forces in pushing toward finish line. Traditionally, the PMTCT intervention a pregnant woman receives has depended on the clinical progression of her HIV. That meant that only the sickest (with a CD4 count of under 350 cells/mm3) were eligible for treatment, while others received ARV medication only to keep from passing the virus to their children during pregnancy and breastfeeding. In 2011, Malawi challenged this paradigm, developing a simplified, public health approach to PMTCT and treatment that offers all pregnant women — regardless of their CD4 count or clinical staging — lifelong ART. We call this Option B+. Option B+ also protects and maintains the mother’s health while providing lifelong reduction of HIV transmission to uninfected sexual partners, and preventing mother-to-child transmission in future pregnancies. We’ve seen considerable progress in Malawi. One year after its initiation, Malawi achieved a remarkable 700 percent increase in the number of pregnant and breastfeeding women on ART for life. Additionally, the scale-up and widespread implementation of Option B+ has quadrupled the estimated number of infant infections averted. Option B+ represents an important step toward achieving an AIDS-free generation. While Malawi was the first country to adopt it, other countries, including Rwanda, Uganda, and Haiti, have since followed suit. And more than fifteen other countries are exploring pilots or a phased roll-out of Option B+ in the near future. Success in implementing Option B+ across countries with high HIV burdens will help us meet the targets set by President Obama on World AIDS Day in 2011 for the United States, through PEPFAR, to support six million people on ART and provide antiretroviral drugs to prevent mother-to-child transmission of HIV for 1.5 million pregnant women living with HIV by the end of 2013. With PEPFAR directly supporting ART for more than 5.1 million people worldwide, as of the end of September 2012, we are on track to meet that goal. Our unwavering commitment and continued focus on making smart investments in strong evidenced-based interventions will help future generations by protecting infants from HIV infection while bringing sustainable, lifesaving treatment to mothers. It has been 10 years since the inception of PEPFAR, and we have more hope than ever that an AIDS-free generation is within our reach. 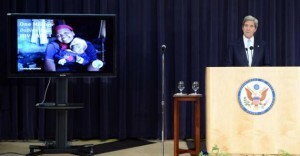 You can follow Ambassador Goobsy on Twitter: www.twitter.com/@PEPFAR . Editor’s Note: This entry also appears on The Huffington Post . Ambassador Goosby (Feb. 20): “Today’s report by the Institute of Medicine (IOM) is a strong validation of PEPFAR’s ongoing commitment to saving lives through smart investments. 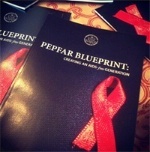 We are proud that the IOM stated that PEPFAR has played a transformative role in the global response to HIV. We stand ready to continue to play this role as we work with our partners across the globe to create an AIDS-free generation. We look forward to carefully reviewing all of the IOM recommendations. We are already taking action on many of the recommendations as we implement the Obama Administration’s Blueprint for Creating an AIDS-free Generation released on World AIDS Day last year.